I make no apologies for writing once again on Israel’s racism towards African asylum seekers who escaped from war and genocide in Africa in the mid 2000’s. Up to 60,000 came from 2005 onwards but after 2011 and under Netanyahu’s regime they were treated as the enemy within. When the Palestinian refugees were expelled in 1948, because without ethnic cleansing, a Jewish majority state could not be formed, those who tried to return were called ‘Infiltrators’. The idea that those who were born and were indigenous to the land should be called infiltrators by those who were settler colonials beggars belief but is part of the racist mentality of colonialism. 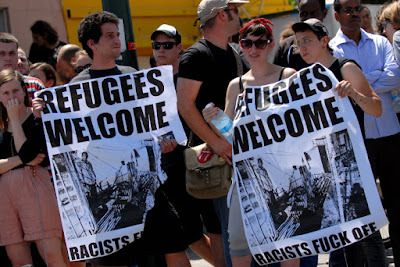 Many refugees have settled in the south of Tel-Aviv where they have been subject to pogroms and violent demonstrations by racist Israelis. This, you understand, in liberal, gay friendly, pink washing Tel-Aviv. They are accused of having illegally entered Israel because it is illegal to claim asylum in Israel. 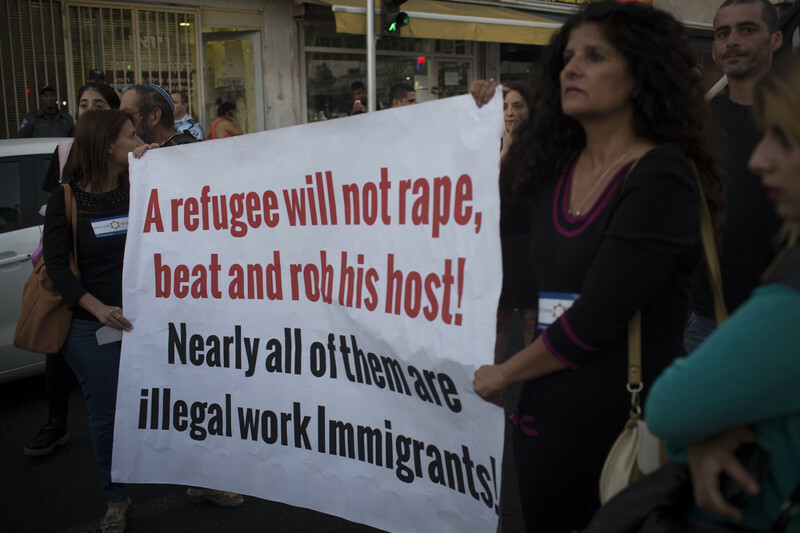 All refugees in Israel are, by definition, illegal. Even worse though is the attitude towards them. 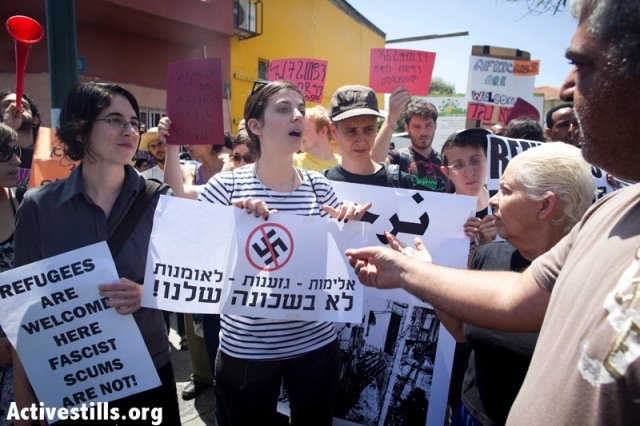 Culture Minister Miri Regev called them a ‘cancer’ in Israeli society. When criticised for this comment, she then apologised to cancer patients, for having compared them to asylum seekers. Israel is now proposing to steal, because that is what it is, 20% of the incomes of the poorest section of Israeli society, people who have little or no access to medical or health facilities, who get no public housing or benefits. There used to be strong Jewish religious principles in Jewish religious law about sheltering the stranger, even offering them up your own bed. 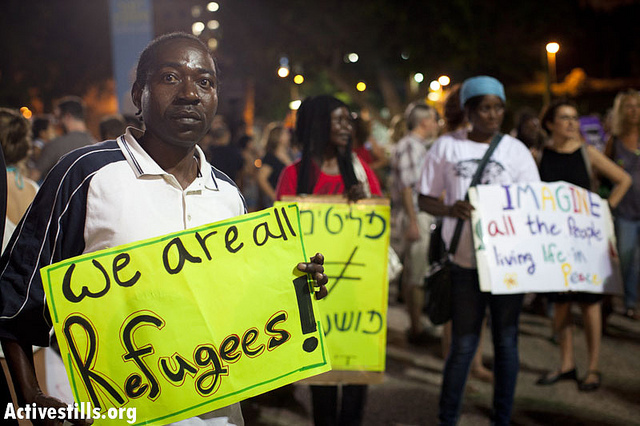 Israel, as a racist ethno-religious state, sees that refugees are not Jewish therefore they should not be there. SHIR HEVER: Welcome to the Real News Network. From the beginning of this month a new policy's implemented in Israel. 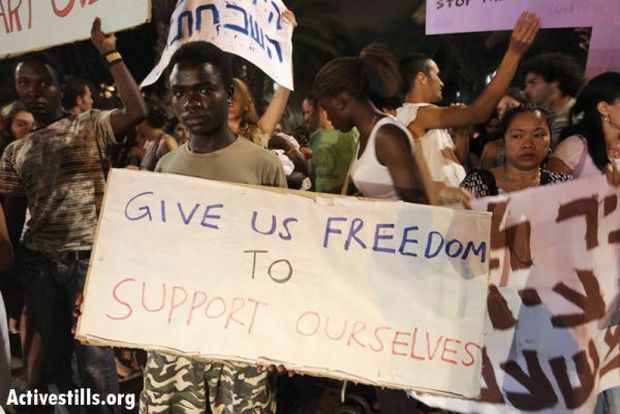 African asylum seekers who work in Israel have part of their wage income garnished by the state and placed into an account to which they have no access. According to a law which was legislated in 2014 and only now implemented, 20 percent of the wage of asylum seekers will be deposited into a special bank account. In addition their employers will be required to deposit 16 percent of the wage which would normally be allotted to the worker's pension and to the future of severance compensation into that same account. And the asylum seekers would theoretically gain access to the money saved, only upon leaving the country. Israeli bank, Mizrahi Tefahot, has won the tender to manage these accounts, and has already informed its' investors that the policy would improve its liquidity and reserve ratio, because the money will not be accessible to its owners, and the bank can use it to offset loans. They policy is intended to discourage asylum seekers from entering Israel or from working in Israel, but as most of the asylum seekers in Israel are refugees from Eritrea or from Sudan, escaping conditions of slavery and mass murder, one really wonders if the policy will act as a deterrence, or merely as a mechanism to make the lives of these refugees even harder than they already are. As refugees are usually forced to work in precarious and low wage jobs, garnishing a significant part of the wages make it very difficult for them to make ends meet. So we are joined now to speak about this with Lia Tarachansky. Lia Tarachansky is an Israeli Russian Canadian journalist and documentary filmmaker. She reported for the Real News Network on Israel and the Palestinian territories. She's made five films already, and one of them Ethnocracy: Israel's African refugees, is specifically about the topic that we want to discuss right now, so thank you very much Lia for joining us. LIA TARACHANSKY: Thanks for having me Shir. 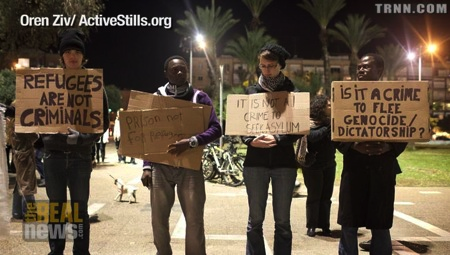 SHIR HEVER: So, how many asylum seekers are currently residing in Israel? LIA TARACHANSKY: According to the latest estimates, and also from the numbers of the Ministry of Interior, about 40,000. SHIR HEVER: And let's talk a little but about the history of this situation, because Israel was responsible for expelling hundreds of thousands of Palestinians, creating the longest lasting refugee population in the world since 1948. But no longer the largest refugee population. Does this have an effect of how African refugees are seen and treated within Israeli society? LIA TARACHANSKY: So the mechanisms that the state of Israel is using to essentially expel, imprison, and minimize the number of African refugees in its attempt to be the first developed nation with zero refugees, are the same mechanisms that the state of Israel and pre state used against the Palestinian refugees. For example, the anti infiltration law, closing the borders, and mass expulsions. Including a whole matrix of administrative and bureaucratic manipulations in order to basically withdraw status from people. So those same processes that the state of Israel uses against the Palestinian refugees, are used against the African refugees. 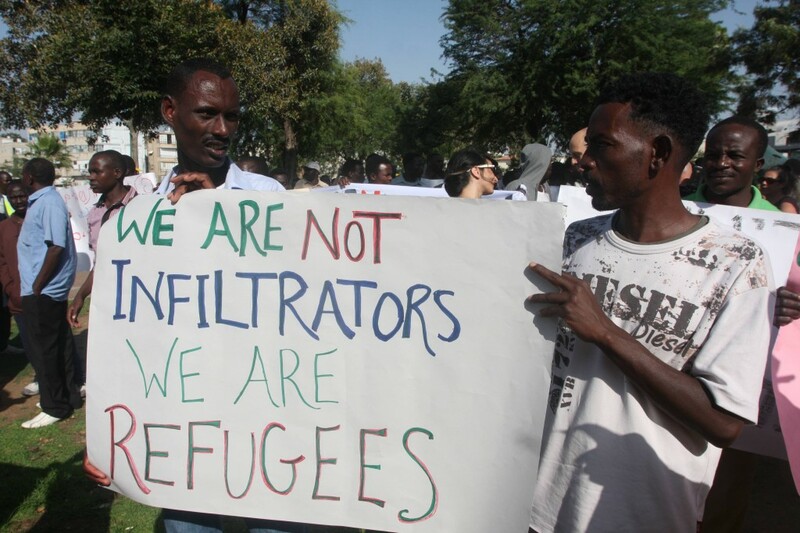 However, the African refugees don't have any history of conflict, neither with Israel nor with the Jews. And so when they first arrived in 2006, they were actually welcomed and treated well by Israeli soldiers that were greeting them at the border, and then by the Israeli public. But when the government of Netanyahu decided to take a 90 degree turn on that treatment of the African refugees, what resulted was a full out war against them. Even though they don't have a history of conflict with either Israel or the Jewish people. What's amazing is that because, or rather despite the fact that these people are escaping genocidal regimes that are actually at conflict with the state of Israel, and it would be a phenomenal propaganda tool for Israel to treat these people humanely, instead what the government does is incite against them, dehumanize them, an essentially treat them and scapegoat them as if they are the core of the problem. So for example, in the city of London alone, there are 250,000 asylum seekers, refugees, and other claimings. In the entire state of Israel , there are 40,000. They are less than .001% of the population, and yet they are constantly being talked about as though they are threatening Israel's Jewish majority. A demographic threat, which is something that the state of Israel uses frequently against the Palestinian minorities in Israel. So what's amazing here is that we're seeing that even a population that is innocent of any of the kinds of things that the state Israel accuses its enemies of, is still being treated as an enemy, simply because they are not Jewish. And the product of all of this is because of course, Israel is an ethnocratic state, which means that only Jewish people can become citizens. Which means that there is no mechanism whatsoever for anyone to actually be in Israel long term, unless they are Jewish. SHIR HEVER: I want to get back to the point that you focus on. Policy of the Israeli government, that there is some tension also between the Israeli government and the Israeli public on this issue. Or maybe not tension, but some divergence of opinion. Because originally, and we've covered this in the Real News, the Israeli government, the giant prisons, to keep all the asylum seekers incarcerated without a trial, and this policy was found illegal by the Israeli high court. Now many asylum seekers are still in prison, but this new policy of garnishing wages, do you see this as a response by the Israeli government or by the Israeli parliament to the decision of the high court? LIA TARACHANSKY: I don't think those two things are related because the cabinet and the government of Benjamin Netanyahu has proven not once, and not twice, that they are simply willing to ignore the rulings of the Supreme Court, where those rulings do not serve their interests. They don't need to prove anything. They don't need to actually counter the court in any way. They're simply not implementing it, and there's a silent consensus about that on the entire spectrum of the Israeli Zionist political leadership. 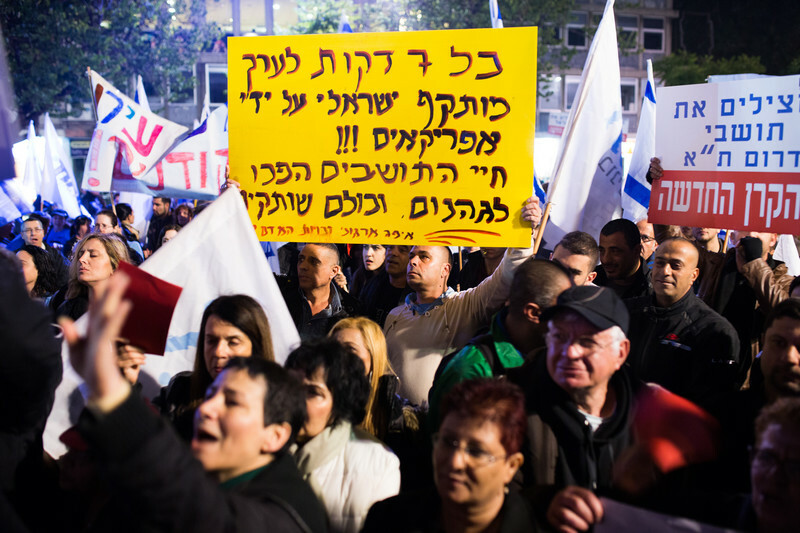 Even so called centrist politicians like Tzipi Livni and Yair Lapid and Yitzhak Herzog are all respecting the status quo of essentially ignoring the ruling of the supreme court. But if you're trying to understand where this latest attack on African refugees fits, what you need to do is look at it from the perceptive of the five part plan that the government of Netanyahu actually implemented. And this is the plan that we cover in the film that I co directed with Canadian filmmaker, Jesse Freeston, called Ethnocracy: Israel's African refugees. So if we're looking at it as step by step by step, the first step that actually took place was that the Government basically said, "These people have no status." And so, when they were first were coming in, what a lot of African refugees did, is they would go to the UNHCR, the UN body responsible for refugees. What the government did in its very early attacks, is it basically gutted the UNHCR of the ability to decide who is and is not a refugee. And the UNHCR office in Tel-Aviv basically just became a shell. A meaningless rubber stamp that had no power whatsoever. So the Ministry of Interior basically gutted that ability and the used that ability to basically say, "Well we don't know who's a refugee, because, nobody's checking who's a refugee and who is not a refugee. Therefore these people are not refugees." So that was the first attack. The second attack is that they used that designation as essentially not knowing and not wanting to know and eliminating the processes of getting to know, who is a refugee, to then mass deport anyone who is from a country that the government decided is deportable. And under this policy we saw the Ivory Coast refugees deported. Some of them in the middle of the night by riot police. We've seen the south Sudanese refugees reported. Of them, more than half have ... We can't track them down. There's been dozens and dozens of people that have been reported killed as a result of this policy. 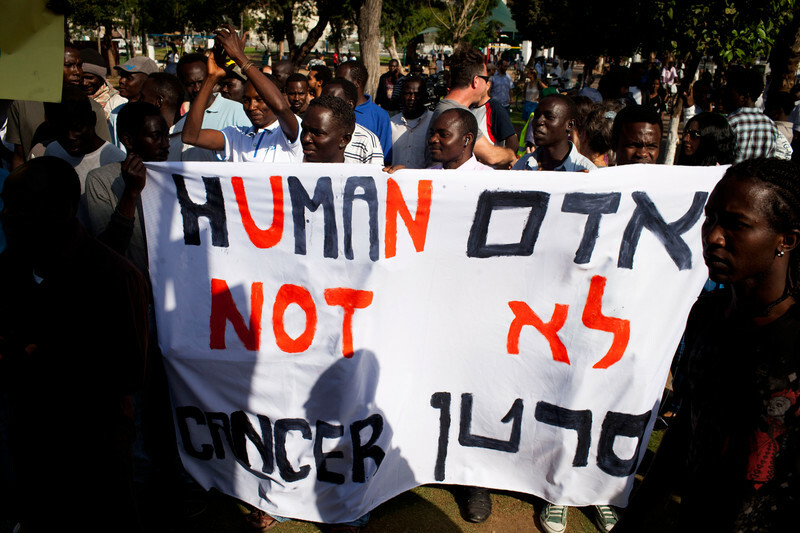 A direct product of Israel's attack on the African refugees. And basically, over the years, since 2011, when a few right wing politicians saw that they can use xenophobia to basically ride a wave of racism to the front of the parliament from the back benches, which is where they were, we've seen this huge change. And in that change we have seen all of the African refugees that are basically not from Eritrea and Sudan deported with a few individuals as exceptions. Then the next step was that the government of Netanyahu built a 240 kilometer wall along the border with Egypt for the first time in human history, cutting off Asia from Africa. And this wall essentially reduced to number of African refugees entering Israel to zero. The next step was building the biggest prison for refugees in the entire developed world. And they build this massive camp in the middle of the desert, surrounded by other prisons and military bases and they basically created a racial profiling police force that went down the streets of Tel-Aviv and asked for IDs from anyone who is brown or black, and then basically on mass deported thousands of people to this prison. And so, the last step of the program essentially has been to pressure those people that are in that jail and everyone else who hasn't yet been put in jail into self deporting. So this is the most important part of the 5 part plan. Which is essentially, the government of Israel knows that if they deport Eritrean or Sudanese refugees, which are refugees that come from countries that the level of refugee recognition worldwide for them is about 80% and up. If they deport people to these regimes, Eritrea being a dictatorship, and Sudan being essentially run by a war criminal genocidal maniac. If they deport these African refugees to these countries, they would significantly lose the support of the international community because they would be seen as clearly non-humanitarian move. So instead what they do is that the government of Israel basically came to an arms agreement with a number of three African states on a number of arms agreements. Basically saying that those states are gong to take Israel's unwanted African refugees, in exchange for discounts of arms being sold to them by the state of Israel. And now they're trying to shuffle the African refugees to self deport to one of these three countries. And the latest attempt in the pressure which the UNHCR actually said is in complete violation of international law, is to push these African refugees to self deport because of also basically stealing 20% of their salaries. Now as you yourself reported Shir, when you were talking about the Histadrut basically theft of the taxes of Palestinian laborers, I have every little faith that the African refugees are ever going to see that money again. SHIR HEVER: Well finally I want to get back to the point that you said before when you made the comparison with London, for example. And you said that Israel has the largest prison for asylum seekers in the developed world. Lets talk a little bit about kind of the international comparison. Is there any other county in the world that garnishes the wages of asylum seekers in this way in order to create an incentive for self deportation? And do you think that this policy is completely for internal purposes, like you said? For the back ventures to be able to move forward through populism or is it also something that could affect policy towards refugees in Europe or in other countries, which might copy Israeli policy. LIA TARACHANSKY: Yeah so the African refugees, like the Palestinian laborers, paid taxes to the state of Israel while they receive absolutely no services whatsoever from the state of Israel. They don't get shelter, they don't get basic food supplies, they don't get healthcare. Zero, nothing. So on top of paying taxes to a government that does not provide them with any services, they are now going to have these wages taken. And as far as I know, and I'm of course not a refugee expert, no other country does that. Now you have to understand that Israel actually promotes itself to Europe, which is currently seen as in a crisis of migration, as the frontier of effective policies on how to basically prevent migrants from coming into your borders. So Israel is using this as yet another tool in its marketing campaign that its trying to convince other western nations, other developed nations, to adopt in their attack on globalized migration. SHIR HEVER: Alright this is very interesting but of course very concerning about what will be the implications of this policy. Thank you very much, Lia for joining us. Israel jails asylum seekers, labels them "infiltrators"